The authorities in Guatemala have ordered some 40 families to leave their homes close to where a landslide killed at least 253 people last week. 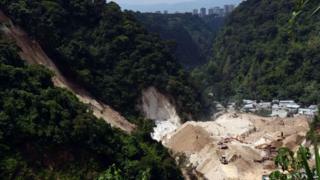 They say there is a risk of another landslide hitting the area, near the capital, Guatemala City. The government will decide on Monday whether to suspend the rescue work. An official investigation is under way to determine why houses where built in El Cambray 2 neighbourhood despite warnings of a possible accident. Guatemala's National Disaster Reduction Commission (Conred) warned as early as 2009 that there was a risk of collapse. The middle-class neighbourhood was built at the bottom of a steep hillside next to a river, some 15km (nine miles) east of Guatemala City. Conred said its most recent warning came in November 2014 when it alerted local authorities to the fact that the river was eroding the base of the hill. But residents said they had not been made aware of the risks. The official number of people missing has been revised upwards to 374, said Conred director Alejandro Maldonado. Most of them are presumed dead, buried under tons of soil and rocks that slid off the rain-sodden hill last Thursday. "We will carry on with the rescue work during the weekend," said Guatemala's Deputy Health Minister Israel Lemus. The government has promised to build new homes for the families evacuated. Guatemala's Congress has approved $2.6m (£1.7m) in funds to help the victims. The local school building is currently being used as a shelter for some 400 people left homeless.